Well, I received the small Zeiss the Friday afternoon of 30th, March, 2001. Then the cloudiest weather came to Spain from 100 years ago, so soon I was making “mountain observing” from inside the living-room of my flat. Anyway, this revealed a very interesting thing: In the border where the snow finds dark rock no chromatic aberration was found. Later, some artificial stars from light bulbs located about 1 km from my home were rendered as beautiful pinpoints. While defocusing these lights, I observed nice diffraction circles with exactly the same pattern inside and outside focus. I started to suspect this would be a class refractor. Some weeks later, I observed the Sun (always with a filter, of course), and the results were better than using a Televue Ranger, and even approaching a very good 4” achromatic refractor. Finally, clouds opened and the first stellar light from out of our solar system entered the Telementor. Regulus (Alpha Leonis) was beautiful and cranking up the magnification up to 221x I knew this refractor will be a fantastic observing instrument forever. The population in Spain is usually concentrated in flats inside towns, so in order to observe with the telescope, I always must to drive a bit. In Oviedo there are some places in the suburbs that allow casual observing, with 3.0 limiting magnitude skies. More suitable places are “Via Pará” at about 900 meters over sea level while climbing the “Angliru” mountain and “Smoking Hill” (El Fumeru) at 500 meters over sea level. Anyway, my preferred observing site is “Sena de Luna”, located 80 kms south from Oviedo at an altitude of 1,200 meters and with a naked eye limiting magnitude of 5.5-6.0 on new Moons. Transparency is usually 8-9 in a scale from 0 to 10. Seeing is also excellent. Double stars are my preferred objects. Incidentally, bright stars such as Antares, Vega, Arcturus, Sirius, and the like are lovely thorough this refractor when observed at high magnification (I use 221x for this) because the coloration is rendered without false color and you can enjoy a lot from the intrinsic tones of stars and nice diffraction rings. Although a bit prosaic, Epsilon Lyrae has been up to now my best “delight” with the Telementor, because using a Televue star diagonal and a 40mm Plössl eyepiece, I observed a clear elongation at only 21x in both doubles from this system. I needed to rub my eyes in order to believe what I was observing! I have the standard Carl Zeiss Jena H-25mm and the 16mm, 12.5mm and 10mm Carl Zeiss Jena Orthos. All provide very sharp views, but I also use 1.25" Baader Eudiascopic eyepieces in the following focal lengths: 35mm, 20mm, 10mm, 5mm and 3.8mm. I found they are so sharp as the Zeiss Orthos, but offering a bit more apparent field (52º). In order to observe the Sun, I use a Baader solar filter. Yes. I’ve compared it with my 4” Vixen achromat (the wonderful one made in Japan, no the ones made in China). While the Zeiss has a more quality objective, the Vixen is also very good, so the difference in aperture becomes decisive (63mm against 102mm is a lot in this small class). On the other hand, the Zeiss is rather easier to transport, so I think I’m going to use more the Zeiss than the Vixen, specially for solar observing. It's intereting also to note the Telementor has a better star-test than my Takahashi FS-102. Although the FS-102 has an impressive extra and intrafocal difraction rings image, the ones from the small Zeiss are even beter. Just imagine! I’m also working out a deep comparison between the Telementor and the Televue Ranger in these days. It’s a really interesting showdown, and in a near future I’ll write about the results. 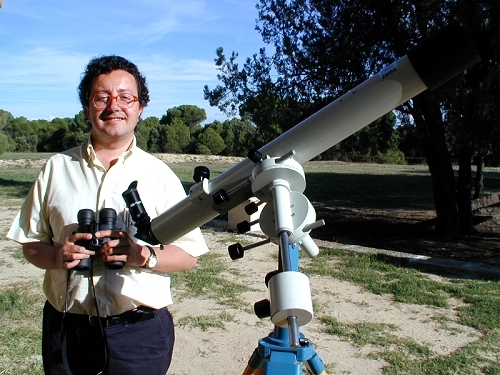 [Update: The Spanish magazine "Tribuna de Astronomía y Universo published in the October/2001 issue my article "Zeiss Telementor vs. Televue Ranger, dos refractores de gran personalidad"]. Yes, I’m happy with it. The best “Pros” are its excellent optical and mechanical quality. In fact, the images through it make me to remember the typical “Astrophysics” image (or let’s say, Astrophysics images appears as something really close to Zeiss images!). Mechanically, it’s superior than an Astrophysics, and this is a lot to say about a telescope. The only “cons” is the manual device in RA for following an object in the sky. You need to “rewind” this actuator every 30 minutes or so, but soon you get used to it and then it becomes second nature. No more for now. Only to say every observer would enjoy using this refractor. When you observe through it not only you enjoy the views that it proviedes, but you also know you are using an instrument from the best family of telescopes ever built in the world.